Gives design points from a sequential full factorial-based Latin hypercube design, as described in Duan, Ankenman, Sanchez, and Sanchez (2015, Technometrics, ). 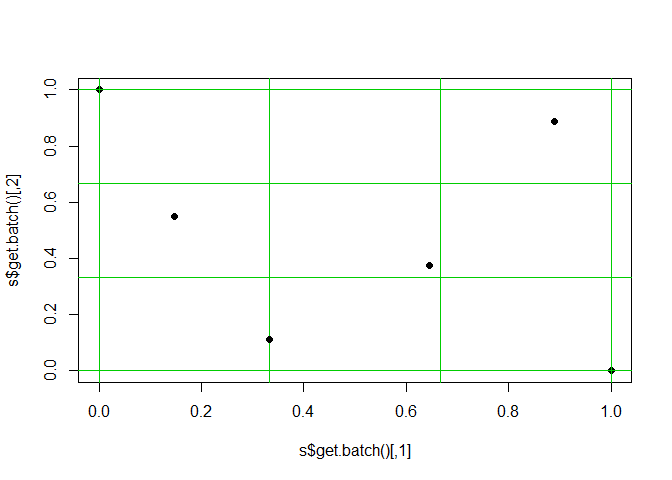 This R package provides a class that generates experiment sFFLHD designs. Sequential full factorial-based Latin hypercube design were created by Duan, Ankenman, Sanchez, and Sanchez (2015, Technometrics). To create a new design you use the function sFFLHD$new and must give in the number of dimensions, D, and the batch size/number of levels per factor, L. An example is shown below (the last line can be repeated when run in console to see how new batches are added). By default the new points are selected using maximin distance optimization to spread them out. This is why points will end up near corners. This option will slow down the code a little but generally not noticeably compared to what the design is used for. If set to FALSE then the points are randomly placed within their small grid box. Fixing issue with README (image moved to tools folder). This is the first version of this package. I had written the function before but am now putting it into its own package for others to use. Moved DoE.design to Depends since the entire package needs to be loaded. I'd rather not do this, but it's the only way to get it to work.